Get ready for the First Day of School with this quirky set of printable photo booth props! These are perfect for 1st or first day of school pictures, back to school parties, or even for use in the teacher's classroom school. There are 15 quirky props in this collection, including a school bus frame, an apple frame, wise owl mask, and many more. The included chalkboard and trophy have EDITABLE text for you to write your own messages! The props are sized both for adults and child-size. ♥ (1) Chalkboard with "First Day of"
♥ (5) Pieces to make a pencil - the tip goes above the head and the shaft beneath! ♥ (6) Pieces to make a crayon - the tip goes above the head and the shaft beneath! ♥ (10)1 paint brush with GLITTER (approx. 7") ♥ (11) 1 paint palette with GLITTER (approx. 9") ♥ (12) Chalkboard with "School is cool"
♥ (13) Chalkboard with "ABC"
FUN FOR Back to School：Creative Back to school themed photo booth cutouts, a special addition for your party time. Get the elements included apple style, Sign, School Bus, study app;liance etc in one pack. Special spelling "School is cool 'Til You Wobble" to have fun with your students friends and kids. PERFECT FOR SIZE! Sizes Vary by prop and range from about 5" to 9.8". Most, but not all include glitter accents. This set uses bright colors, we sure you all will love it! All of our Props our cut from high quality cardstock and some may be include high quality marker writing. THEME PARTY DECORATIONS: There are many fun ways to use these cute photo booth props! Use as intended "Preschool", "Kindergarten", "First Grade", "School"and take party photos to share; add them to vases and floral arrangements as a fun FIRST DAY SCHOOL candy buffet by displaying them in apothecary candy jars! HIGH-QUALITY PARTY SUPPLIES: Our photo booth props are professionally printed on thick cardstock paper. They will arrive cut out and ready to assemble with the included wooden dowel sticks and adhesives. DON'T HESITATE: Use the funny photo booth pros welcome kids and their families back to a new school year. 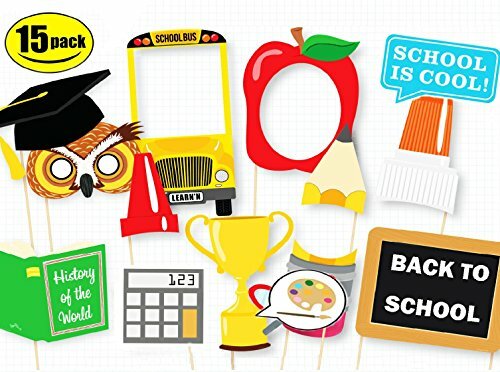 Make this year more memorable than ever with these Back to School Photo Stick Props. Set up a photo booth at your back to school open house or place on tables for family photo opps!